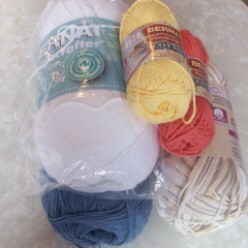 Bernat Handicrafter cotton yarn was one of my first favorite yarns. I remember I crocheted a ton of dishcloths with it when I first got serious about crocheting. I also knit quite a few using this yarn, and to be honest, knit dishcloths worked a lot better in this yarn than crocheted ones do. I found that they were a lot softer and easier to work with. Nevertheless, dishcloths made in this yarn also work very well. This worsted cotton yarn is not only suitable for dishcloths, but for a variety of other crochet patterns as well. It is a natural and super absorbent yarn, which makes it ideal for the kitchen, bath and for other items around the home. The softness of the yarn also makes it perfect for baby items. The yarn is quite popular and is available at most yarn stores. It is available in large balls as well as in smaller balls that have just enough yarn for an average-sized dishcloth. As for colors, it comes in many solids and ombres suitable for spring, summer, fall and the holiday seasons. There are also many variations of this yarn including Stripes, Twists, Holidays and more. The only downfall is that cotton does not have much stretch to it, and therefore, is not recommended for clothing items where stretch is required. It also fuzzes if not washed properly and does not drape well, which takes away from the yarn. But for cleaning items it doesn’t matter so much. Although I’m starting to lean towards a size 3 crochet thread for dishcloths, Bernat Handicrafter has for many years been my favorite yarn for dish/washcloths and hotpads. It is great for absorbing spills and also acts as a natural and gentle scrubber. A size 3 crochet thread has the same qualities, but it is not quite as bulky as Bernat Handicrafter. I also love the Handicrafter yarns for making bath scrubbies, soap savers and mop covers. You can get many patterns for this yarn online at the Bernat.com website. In order to access the patterns you will need to register (for free) at their site. The balls of yarn usually come with a pattern printed on the back of the label as well. You can purchase your yarn through my Amazon link. Because I love the yarn so much, I have used it to design a few patterns of my own. 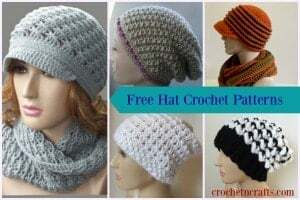 You can find the free crochet patterns here. Hope you enjoy the yarn as much as I do. Im 82 and have used your cotton for years and I made many thing from it now I make dish cloths make a bundle of Five and hand them out to people it always puts a smile on there faces I give to shops all staff and banks hospital and just on street ot Dr waiting rooms . I love doing it I knit my own patter n and size , I’m very happy with it but I like to knit with the start of the cotton which is in middle of roll and some times it’s easy to find other times it’s so hard to find it I have to roll it into balls . Which is hard for me . Why can’t you put a little tab on the cotton and just leave it on outside so people can see it . I brought three other day 1st one I found the other two can’t so have to wind them all up into ball . But just letting it come from the middle of cotton is so much easier . So please do some thing just a tag or knot and leave on outside of cotton even a color tip would do , thank you apart from that I love it , but hurts my arms and takes time to rewind it .